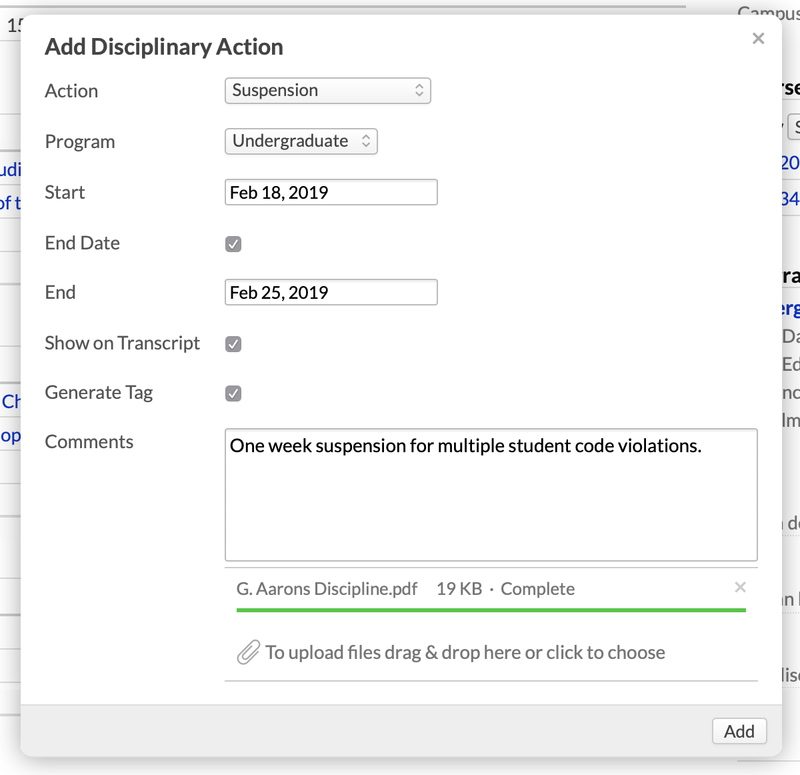 Discipline lets you record academic disciplinary actions against students. When you record such an action, it can then appear on the student's transcript and in various reports around Populi. Academic Admins can see, add, and edit all student disciplinary records. The Discipline role, when paired with another role with access to the Profile > Student view, can see, add, and edit all student disciplinary records. If not paired with such a role, it cannot see those records—only items marked as visible to the Discipline role on a person's activity feed. Registrars can see that the student has an action recorded, but cannot view any details, comments, or files. Advisors can see whether their advised students have disciplinary records, but cannot read them. Staff users can see system tags associated with the action if you choose to add those tags to the student (see below). Financial Admin and Financial Aid users can see whether a student has an action recorded (and the type) on Financial Aid > Reporting > Academic Progress. Students can see actions recorded against them if you elect to show the discipline on the transcript (see below). If these four types work for your school, there's nothing you need to do. They'll be available for you to use when recording disciplinary actions on student profiles (see below). In your request, tell us which of the built-in types your custom discipline types correspond to. For example, your school's Academic Warning corresponds to the built-in Warning type. You can have as many actions as you need. You can request more than one of your custom types to correspond to a single built-in type. Keep in mind that these are meant to record actions rather than specific reasons for the discipline. For example, you might want to change Warning to Academic Warning—no problem there. But if you want Academic Warning: Undergrad GPA Below 2.0, that kind of specificity can make the feature cumbersome and inflexible. Disciplinary actions are recorded on the Profile > Student view in the right-hand column. Check whether to show this action on the student's transcript. Choose whether to add the system tag for the discipline. Keep in mind that if you add the tag, anyone with the Staff role will be able to see it. You can also add comments and files to the record. You can click the discipline action's name to see the details (or click the number to see any files attached to the record). If you've opted to show the discipline on the transcript, you'll see it noted in any academic terms that overlap with the action's start/end dates. If you've opted to generate the tag, you'll see that under Tags in the leftmost column of the profile. You can delete an action by clicking its name and then Delete. Doing so permanently removes the action and all associated comments and files from the student's record. It will appear in various reports (see below). Data Slicer: You can include discipline data in your reports by filtering for the system tags generated by the records. Financial Aid > Reporting > Academic Progress: Hover over to see which discipline type the student currently has. Advised Students: Advisors can see the discipline type for any disciplined students appearing in their Advised Students report.